[Jesus prayed,] "I have given [my disciples] your word. And the world hates them because they do not belong to the world, just as I do not belong to the world. I'm not asking you to take them out of the world, but to keep them safe from the evil one." God loves the world. He sent his Son to die to redeem the world. But, the world does not love God. The world, its processes and powers, rejected God's Son. 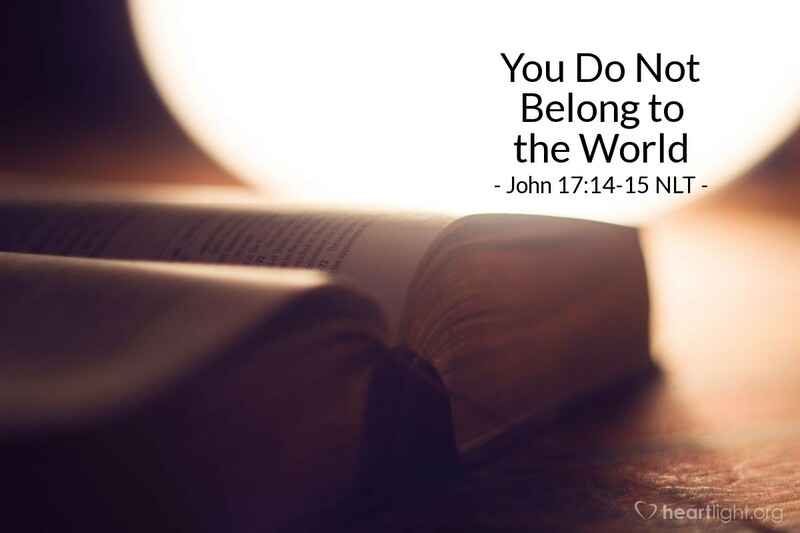 Since we have become Christians, we are no longer part of the world opposed to God and his work. We should not be surprised when the world does not accept us. We should not be shocked when the world opposes and hates us. Jesus longs to protect us, but he does ask us to live in the place of risk; he calls us to join him in helping redeem people caught by the processes and powers of this current world. We are called to live in the light even though we are in a dark world. We are to shine our light to help those trapped in darkness find their way to the One True Light, Jesus. As we do this, we know that Jesus is our advocate at the Father's side, asking that we be kept safe from the evil one. Grant me courage and compassion, dear Father, as I live in the place of both danger and grace — that place of redemption where light penetrates the darkness, and lost men and women are rescued from the decay and despotism of the world and its dark prince. Keep my heart on the light, and my strength renewed when I face the powers of darkness and the hate this world might offer. Please, dear Father, guard my heart against cynicism and hate, so that I can be one of your many tools of redemption. In Jesus' name. Amen.